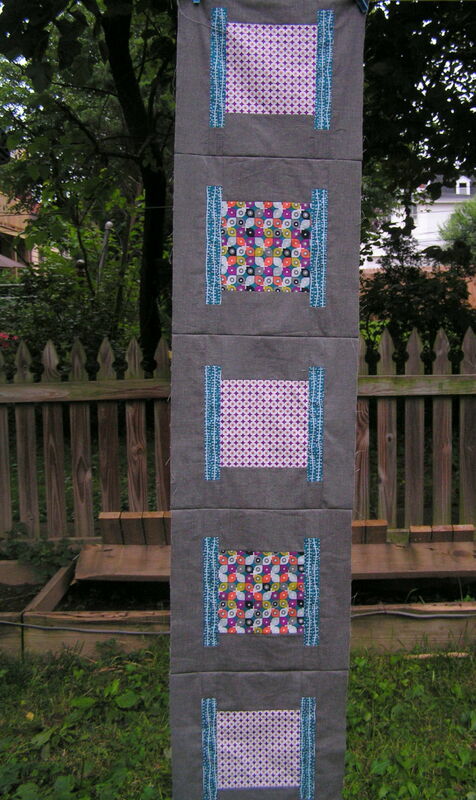 Last night, I finished ironing my blocks for the June Modern Blocks Quilt-a-Long. June focused on the Spool block, which was considerably easier than May’s Follow the Leader, a block that nearly drove me to smash my sewing machine and left me well-acquainted with my seam ripper. I did have to rip out some seams last night, but that is because I originally made my table runner 7 blocks long. After I spread it across the dining room table, I realized that the sample table runner measurement that I looked up online must have been for people born with a silver spoon in their mouths. For those of us with average sized dining rooms and average sized tables like me, the 7 block runner hung below the edge of the table. It wasn’t a good overhang, it was more of the a-guest-is-sure-to-snag-this-and-spill-everything-on-the-table overhang. So, I pulled the out some seams and made a 5 block runner instead. 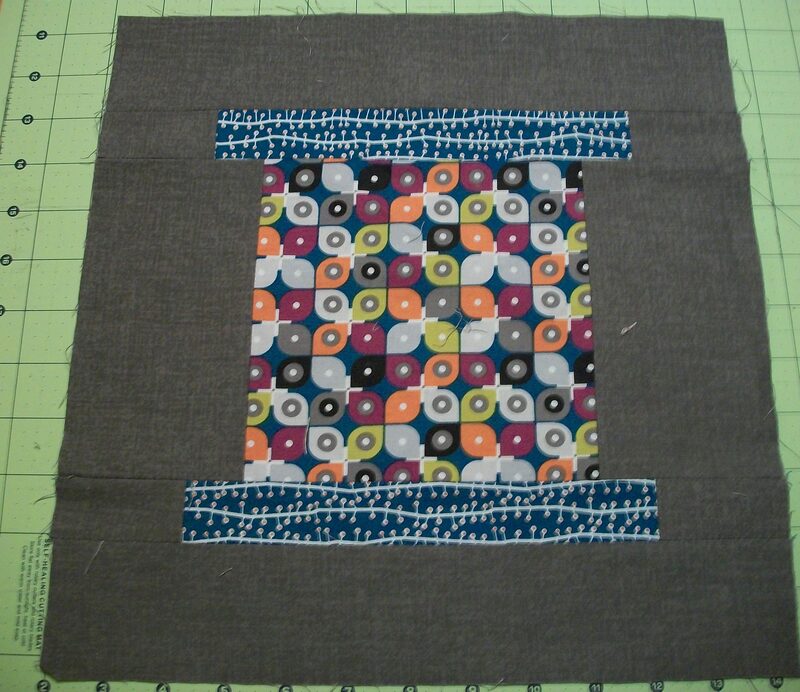 For this month’s block, I used the fabulous MicroMod fabric line from Cloud 9 Fabrics filled in with a little gray. The MicroMod fabrics are the ones that I won from Katie over at Swim Bike Quilt. Thanks again, Katie! If you’re thinking, “Hmm… modern blocks quilt-a-long?” It’s not too late to join in the fun. There are still 10 blocks to go. I think I’m going to try super sizing July’s block. I’ve been wanting to try to blow up a block to table topper or tote bag proportions for awhile now. I’m a little worried about the math involved. Does anyone know of an online calculator that helps change the measurement proportions of a quilt block? 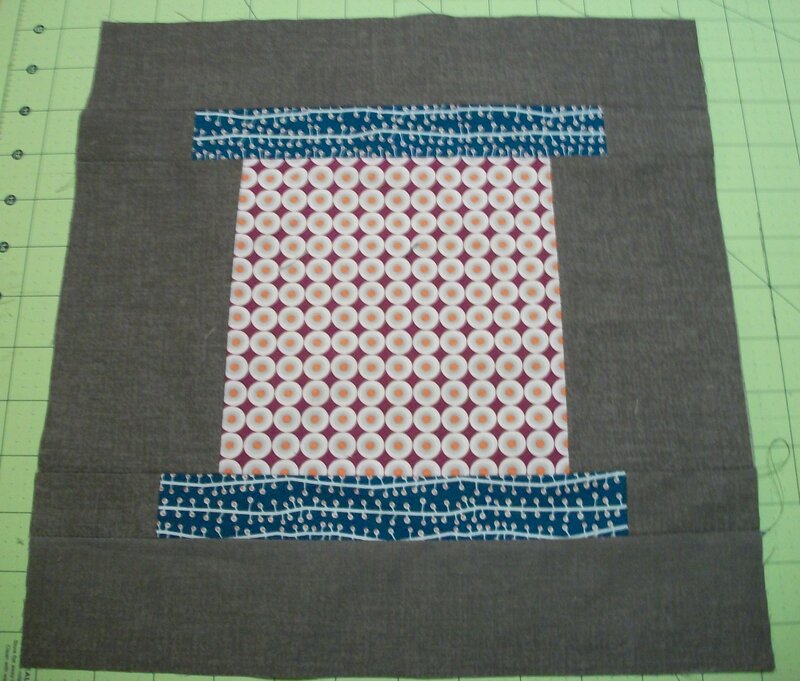 Or, do you have any other tips for expanding a quilt block to double or triple its original size? I’ll also want to take some time in July to quilt the table runner (and fix the eyesore of a walkway that’s in the background of the picture). I’m excited/nervous because I want the quilting to go really well, but I’ll be trying something new — this big diamond, little diamond technique. Alright, my sister is going to be visiting for the holiday weekend and my realtor is coming on the 8th to tell me how much the house would possibly sell for if I decide to move, so as much as I’d love to spend the night quilting, I really ought to spend the night grouting the last of the countertop tiles, fixing some drywall mishaps, stuccoing the bathroom wall, and/or cleaning the house. We’ll see how far I get on that ambitious list. I did have some Starbuck’s iced coffee, so I’m feeling a little wired for the tasks ahead. 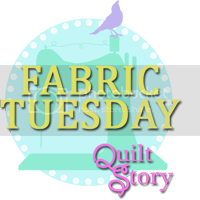 I’m linking up to Fabric Tuesdays and Sew Cute Tuesday this week because I want to procrastinate by browsing through both of the linky parties before I get to that home improvement list. super cute spool blocks and those fabrics rock! Thanks, Kelly, for the heads up. I think I have the no-reply blogger issue worked out now. Your table runner looks fab. I love the fabrics you used for your Spool blocks! And it’s funny that you mention trying to supersize July’s block. Because I have been thinking about doing just that to make a wall hanging! Can’t wait to see yours. Thanks, Amy! I’m excited that someone else is thinking about supersizing that block. I’d love to see how that idea turns out for you. For some reason, I’m getting an error message when I try to get to your blog 🙁 I’ll look for you at the linky party. The dark grey background on your table runner was a perfect choice! It makes the other colors move:) I am an applique lover, so I convert all the pieced patterns to applique and then it is so easy to change the size of a block. very cute blocks. 🙂 Love your fabric choices!